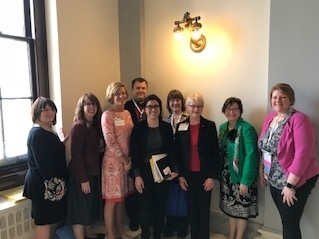 HPCANYS has a strong advocacy program to promote policy, legislation, and regulation that support the Association's mission to promote the availability of quality hospice and palliative care for all persons in New York State contronted with life-limiting illness. 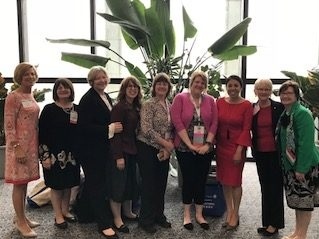 HPCANYS' State Legislative/Regulatory Commitee and Federal Legislative/Regulatory Committee provide support for the Association's advocacy activities. HPCANYS opposes this measure propsed in the Governor's 30-day budget amendments. CMS issued a call for comments on proposed Regulatory Provisions to Promote Efficiency, Transparency and Burden Reduction. CMS issued a call for comments for drafts measure specifications for the hospice quality measure being developed entitled Transitions from Hospice Care, Followed By Death or Acute Care. HPCANYS developed comments, based on the unique environment of New York State regulations. HPCANYS has produces several issue brief addressing proposals in the Executive Budget. Please use these documents to inform your local legislators. Contact us if you need more information. Thank you to: Dan Ayres, Dan Grady, Michael Kaminski, Dan Lowenstein, Laura Niland, Michael Rosenblunt, Robin Stawasz and Amy Stern for coming to our Febuary 6 Advocacy Dav and bringing our message to the Legislature. On Tuesday, January 16, Governor Andrew Cuomo released his 2018-2019 at an executive budget presentation at the State Museum. The State is faced with a $4.4 billion deficit which Cuomo plans to reduce through cuts and spending caps, however, the governor is not proposing any cuts in state aid to "core services." For example, school aid is proposed to increase 3 percent and total Medicaid costs would increase 2.5 percent. To counter the budget gap, Cuomo proposes to raise $1 billion in new revenue via new (or increased) taxes on opioids (hospice exempt), e-cigarettes, internet sales, and health insurance providers. He also proposes to create a $1 billion health care contingency fund to provide for a cushion against expected shortfalls in federal funding fir Child Health Plus and the Essential programs. HPCANYS is still reviewing the budget to parse out specific implications for hospice and palliative care providers. Click here to view the Health Care budget brief from the Executive Budget presentation. HPCANYS has provided budget testimony to the Joint Legislative Hearing on Health. Please click HERE to view the testimony. 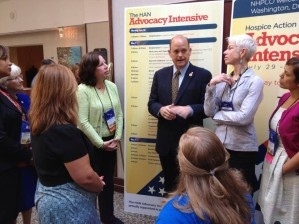 The NY Delegation visited with our legislators in April in a not so warm and sunny DC! 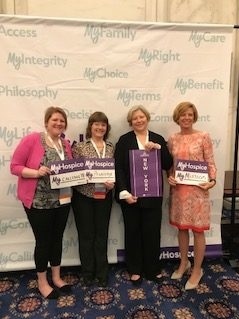 Support the Rural Access to Hospice Act (S. 980/H.R. 1828). When patients enroll in hospice, they select a physician or nurse practitioner to serve as their attending physician. The attending physician collaborates with the hospice in the development of the care plan, and is kept informed of the patient's care. Attending physicians are typically reimbursed for their services under Medicare Part B. However, Rural Health Clinics (RHCs) and Federally Qualified Health Centers (FQHCs) are not reimbursed under Part B. As a result, these clinics, which serve over 27 million Americans in under-resourced and rural communities, cannot provide or be reimbursed for hospice attending physician services. 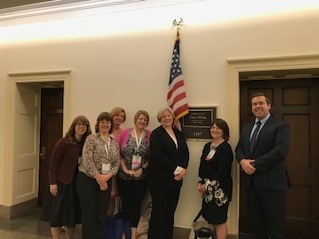 The Rural Access to Hospice Act, led by Congresswoman Lynn Jenkins (R-KS) and Congressman Ron Kind (D-WI) in the House and by Senators Shelley Moore Capito (R-WV) and Jeanne Shaheen (D-NH) in the Senate, addresses this issue by allowing RHCs and FQHCs to receive payment from hospice attending physician services. Support the Palliative Care and Hospice Education and Training Act (S. 693/H.R. 1676). Research from the American Academy of Hospice and Palliative Medicine (AAHPM) indicates that there is a shortage of adequately trained hospice or palliative care providers. Moreover, the current rates of educating and training medical professionals in palliative care will not be sufficient to ensure that aging Americans will have access to quality palliative care. 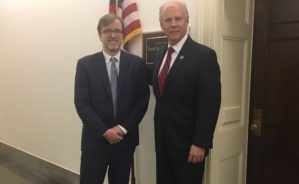 The Palliative Care and Hospice Education and Training Act (PCHETA) establishes a variety of palliative care and hospice training programs that would increase the number of healthcare professionals trained in these techniques. The legislation also supports a national education campaign to increase awareness about palliative care, and supports research to improve delivery of palliative care. In the house, PCHETA is sponsored by Congressmen Eliot Engel (D, NY-16), Tom Reed (R, NY-23) and Buddy Carter (R, GA-1). In the Senate, PCHETA is sponsored by Senators Shelley Moore Capito (R-WV) and Tammy Baldwin (D-WI). Opioids play a key role in alleviating pain and suffering for those with advanced illness and at the end of life. Unfortunately, after a hospice patient's death, leftover medication can sometimes fnd its way into the wrong hands. This situation is compounded by current law, which prohibits hospice programs from destroying or disposing of unused drugs unless authorized by state law. That responsibility is left up to grieving families who are often distraught and do not want to dispose of the medication during that time. The Safe Disposal of Unused Medication Act would grant hospice organizations the legal authority to dispose of unused medication after a hospice patient's death, a measure that would not only ease the burden on the family, but also help prevent potential diversion or illicit use of these drugs. This legislation is sponsored by Congressman Tim Walberg (R-MI) and Congresswoman Debbie Dingell (D-MI). Support the Patient Choice and Quality Care Act of 2017 (S. 1334/H.R. 2729). facilities to follow the patient’s treatment plans. and services they need. 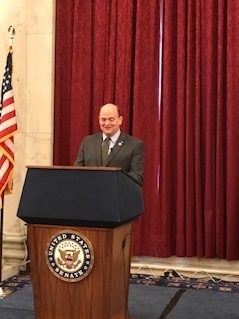 This bipartisan legislation directs the Center for Medicare and Medicaid Innovation to conduct an Advanced Illness Coordination Services demonstration, which will allow an interdisciplinary team to provide early palliative care and wrap-around, home-based services to individuals with multiple and complex chronic conditions. The Patient Choice & Quality Care Act is sponsored by Congressmen Earl Blumenauer (D-OR) and Phil Roe (R-TN) in the House, and by Senators Mark Warner (D-VA) and Johnny Isakson (R-GA). Legislative contacts are divided into two categories, state and national levels. Each of the following links will take you to a site where you can put in some information about your location (like your zip code) and find out who represents you in government. New York State Legislative Contacts New York State Assembly. Click on link and enter your address, city and zip code in the form on the page. You will then be provided a link to your representative’s website, where you will find email and telephone contact information. 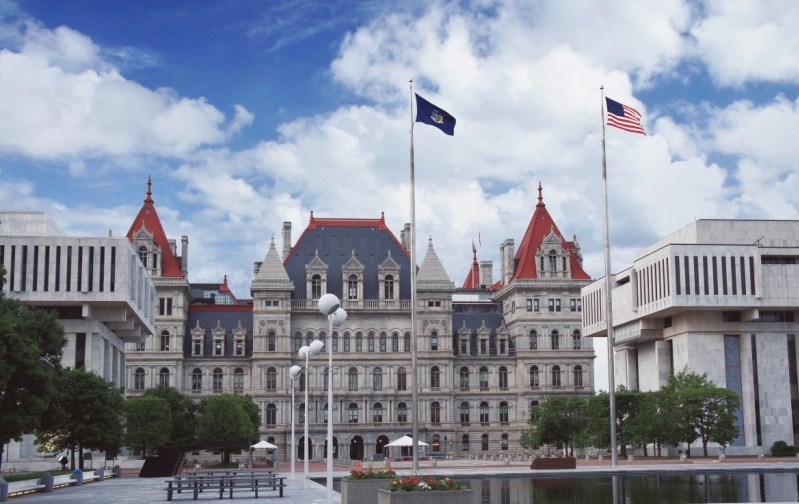 New York State Senate Click on the link and enter your address and zip code under “Find my Senator.” Your representative’s name will appear at the top of the page, and you can write an email directly from this page with the form provided. 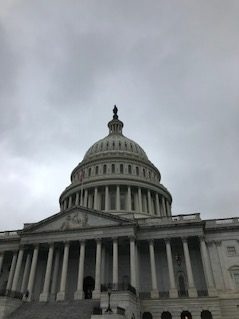 National/Federal Legislative Contacts United States House of Representatives: Click on the link and search for your representative by entering your zip code. Your representative’s name will appear at the top of the page, and you can write an email by clicking on the envelope icon. New York State Senators: This page lists the email and telephone contact information for Chuck Schumer and Kristen Gillibrand, the two Senators who represent residents in New York State.